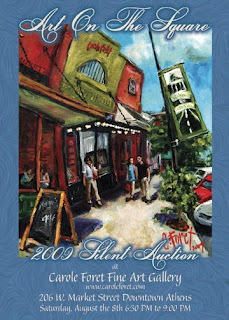 Spirit of Athens: Win this painting!! Carole Foret, local artist and business owner, has graciously donated this painting to be given away at the Art on the Square Silent Auction August 8. For a $10 donation, you get to attend the auction as well as be entered for the drawing. You do not have to be present to win, but, believe me...this is an event you don't want to miss. The number of applicants for the 4th Annual Art on the Square festival, held on the courthouse lawn September 12, doubled this year and most will donate a piece for the auction. Bring your friends, sip some wine and buy LOCAL art!! For more information, call 256.444.8156 (leave a message) or email artonthesquare@hotmail.com. Or mail your check to Art on the Square, P.O. Box 1560, Athens, AL, 35612. Be sure to include your contact information. Thank you for supporting SOA!